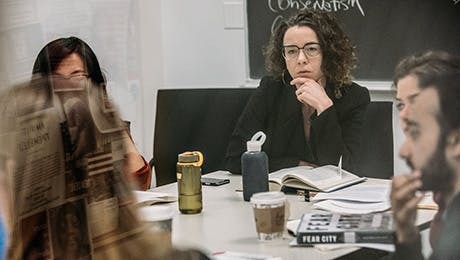 The PhD in Sociology is designed for students who have completed the Sociology MA at The New School for Social Research or a comparable master's degree from another university. The PhD offers qualified scholars the theories and methods necessary to develop sociological study in innovative and imaginative ways, in sustained treatment of a single topic across disciplinary boundaries and/or subcategories of the field. PhD candidates must earn 30 credits in addition to the 30 credits and MA Examination taken in the Sociology MA program, for a total of 60 credits. Transfer students who already have an MA in sociology (or its equivalent) from another institution may be assigned credit for all or part of their previous graduate studies up to a maximum of 30 credits. Incoming students who already have an MA in sociology from another institution will still be required to take and to pass the Sociology Department MA examination. Before being advanced to candidacy for the PhD, students must submit a dissertation proposal for evaluation in an oral exam conducted by a dissertation committee. Students must pass the PhD comprehensive exam (Field Statements Exam), complete 60 credits, and successfully defend their dissertation proposal. The final dissertation must be submitted, approved and defended orally before a committee consisting of four members. With the permission of the department chair, the Master of Philosophy degree will be conferred upon a registered student who has fulfilled satisfactorily all the requirements of the department for the PhD except the dissertation and dissertation proposal defense. Registered students in satisfactory academic standing who have fulfilled the requirements for the MPhil can petition for the degree and receive it en route to the PhD or they may take it as a terminal degree. Students cannot be re-admitted or re-enrolled for the purpose of receiving the MPhil.